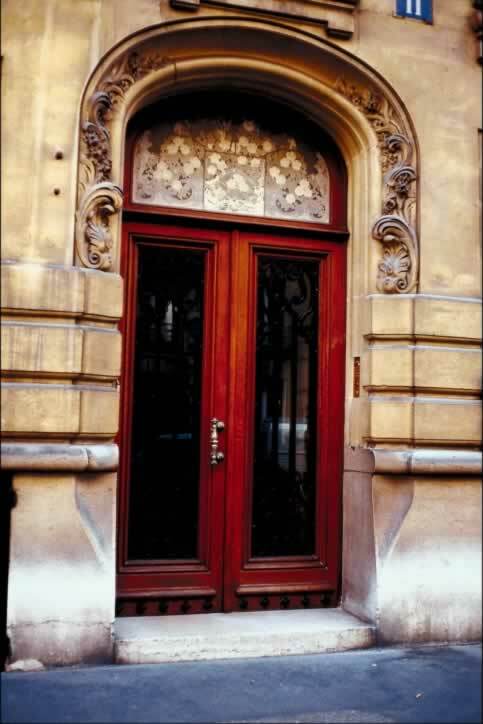 These red double exterior doors invite people to pass through the carved stone arch. Though the fa��ade seems original and the doors suit the building, the panel above the transom is out of place. It is possible that there was a fanlight once and it was replaced with stone tiles with almost abstract painted detailing. Perhaps the intention was to provide a variation of the weathering of the facade. The doors are true French doors, meaning that the only panels in the framed door are lites--another term for a window in a door. Many double doors are not true French doors because they do not have glass the entire length of the door. These doors also have bolection, a type of raised molding frequently seen on doors. The only visible hardware is a single brushed brass door handle on the left door.